Our cyclists for the 2019 Project V360 Bicycle and Vegan Food Tour faced some of the toughest mountain passes in the Philippines during the five days of the tour. That also meant these intrepid bikers, and the rest of the support crew, depended on world-class vehicles for support, comfort, and safety. 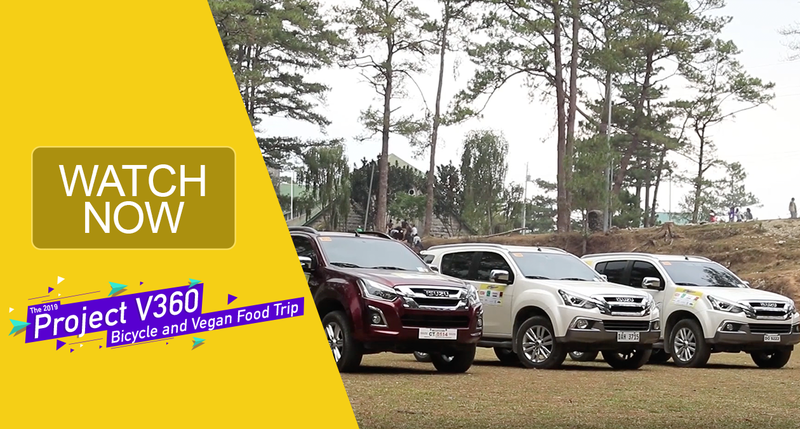 And for this, the dependability and fuel-efficiency of one of Japan’s most iconic diesel-powered nameplates, Isuzu’s light commercial vehicles, the Mu-X SUV and the D-Max pickup powered by the amazingly frugal yet powerful RZ4E diesel engine, were put to the test. At the end of this 5-day epic adventure, covering at least 500 kilometers of mountain roads and long stretches of provincial highways, the Isuzu D-Max pickups and Mu-X SUVs registered a remarkable 10.5 km per liter in fuel efficiency, enough savings on fuel to spend on more enjoyable things about the trip. So, what can we say about the Isuzu D-Max and Mu-X? It doesn’t just take you to amazing tourist destinations, it takes you there in style, comfort, power, and fuel-efficiency, and still leaving you with enough gas money to spare. And that means we get to eat more delicious vegan food!